Your home PLC is networked, you can remotely control it with PLCLink or receive some notification, this is an iOS application. 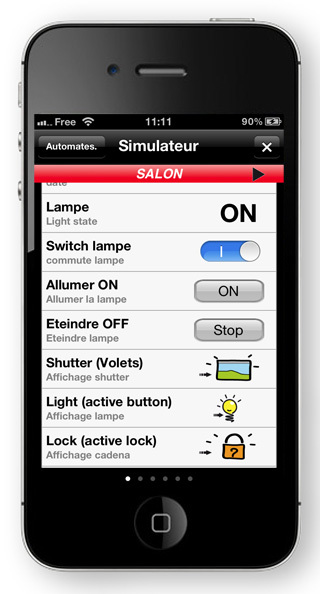 Text, button, switch with powerfull scale setting. HTTP or Modbus TCP transfert. Get information from text, XML, RSS or JSON source. Send and set configuration with simgle email or QR Code. Send cell with email, maybe for IFTTT trig. Logical rooms in wagoML file format. Web set powerfull configuration maker. Easy to set or change configuration. Well suited for home remote with iPhone ans iPad. Lite free version for evaluation. Webcam and video support (mp4, m4v, H264). Security unlock code can be activated for certain areas. Record data in csv file.